Vegas the Twisty Legs Grey: This sweet bird was dropped off at an auto shop with no information except her name. The shop owners were known for taking in unwanted chickens and ducks, but when they saw that this special parrot could not use her legs properly, they called us for help. Based on the X-rays, we believe that Vegas suffered three broken bones in her legs as a baby due to a horrible diet fed to her parents, and she never received any treatment. In her specially equipped cage with soft blankets and platforms to sit on, she is living a great life in our rescue, but we hope to take her to one of the top avian orthopedic surgeons in the country to see if corrective surgeries would help her have an even better life. Larry the Nudist Cockatoo: We got a call from one of the region's largest dog and cat shelters asking for help. 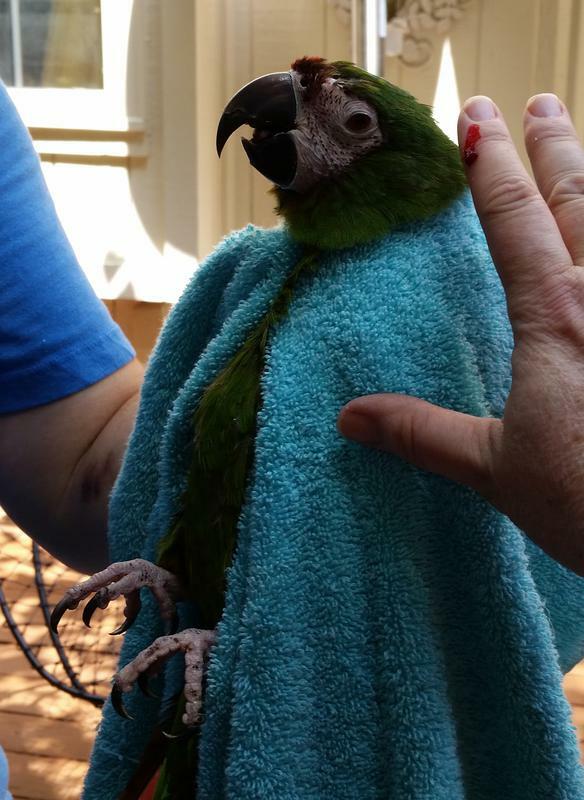 They knew that this parrot that had been dropped off at their facility was in need of specialized care. Larry was completely naked except for some chewed off stubs of wing and tail feathers, and brown discolored feathers on his head. He has now been treated for an E. coli infection, but we don't think he will ever grow most of his feathers back because the follicles appear to have been destroyed from years of plucking. We tried putting some vests and collars on him, but he prefers to practice his nudist lifestyle! His head feathers wouldn't come clean despite our best efforts, so we are waiting for new feathers to grow so they will be white again. The 76 Roosters Rescue: They were scheduled to die. After a drug bust, the cockfighting operation was shut down, but who would want these damaged birds? Nobody thought it was possible to find homes for 76 roosters that were born and bred to kill each other. We proved them wrong. Not only did we find nearly 20 people who were willing to take in all 76 as pets or companions for their flocks of hens, but we also placed almost 50 hens and chicks that showed up in the same rescue trailers as the roosters. These poor boys had been mutilated by having their combs and wattles cut off, probably with a razor blade, but none had yet been in the fighting ring. Three of them had medical problems that required months in the hospital, but eventually they all found happy homes with lots of hens to flirt with! Rescue or die: One day we got a call from a now former client telling us that we had to take her Eclectus Parrot today, or she was going to take him to another vet to have him euthanized because he bit her. 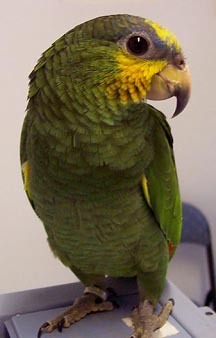 Of course we immediately agreed to take him, even though our rescue was pretty full, so she showed up with the nearly naked parrot, along with an unexpected Conure. She said she also hated that bird! Sometimes it is very hard to be polite to people. Sometimes you just want to punch them in the throat. Both birds stayed with us until they found new homes where someone loves them even if they aren't perfect. Lies, lies, lies: When someone claimed that an unknown person had left 25 Zebra Finches in one tiny cage on her front porch, it sounded unlikely. Almost every year we get a group of 20 or more small birds because someone let them just breed and breed and breed. These birds were transferred to us from a dog and cat shelter that couldn't possibly house so many birds because they only had two little cages to supplement the one cage they all came with. 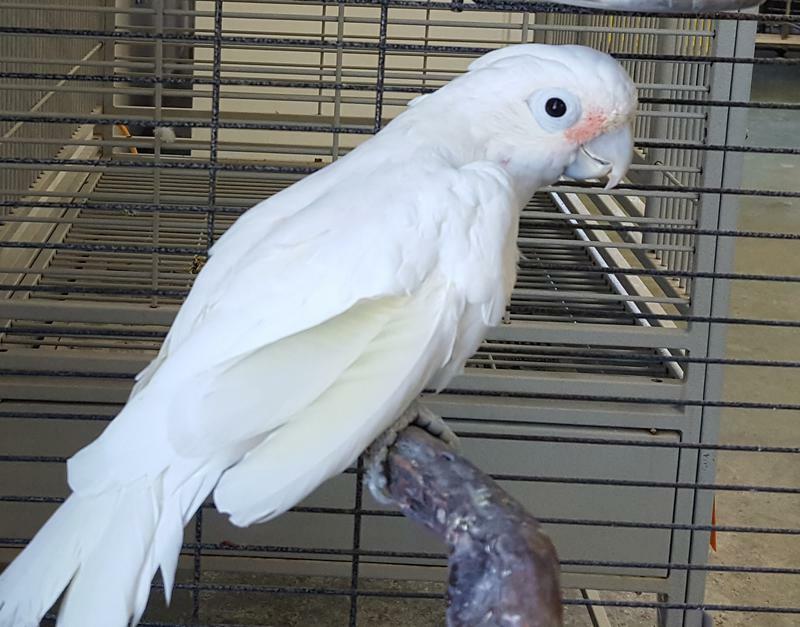 Strangely, these birds came from the same person who took Larry the Nudist Cockatoo to the same shelter. Suspicious? We think so. The last of them has finally been adopted 8 months after they came in! Abandoned duck: Every year our team of volunteers rescues dozens of abandoned pet ducks from area lakes and ponds. This year one of the most pitiful examples was this sweet baby in Antioch Park. You might think that ducks should live on water, but domestic breeds of ducks can't fly, and don't survive long when dumped in the wild any more than a poodle dropped in the forest would. 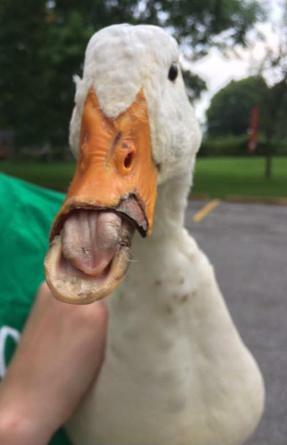 This bird suffered a partial beak amputation, probably from a snapping turtle, because he had been raised in a home by someone who bought him as an Easter toy, but got tired of cleaning up the mess. He will spend the rest of his life eating a special soaked food diet. Pink parrot, red wound: Lyvia the Rose Breasted Cockatoo had mutilated for years. She had a big bloody wound on her chest that had been present without treatment for a long time before she came to us. After hundreds of dollars in lab testing, and months of treatment, we resolved the problem. Today she has not injured herself in several months, and has moved to the home of one of our trusted volunteers so that if there is the slightest hint of trouble she will be back here in a flash. Stray chicken with a broken leg: How many people would volunteer to take care of a chicken with a femoral fracture? People kill and eat chickens, right? Not at Burge Bird Rescue. We bandaged around her body and leg, kept her in the hospital for weeks, and when she was able to come out of her bandage she was a happy, normal girl! She now lives with a flock of other pet hens who will live out their normal life spans foraging for bugs and treats on a farm that doesn't kill their animals. 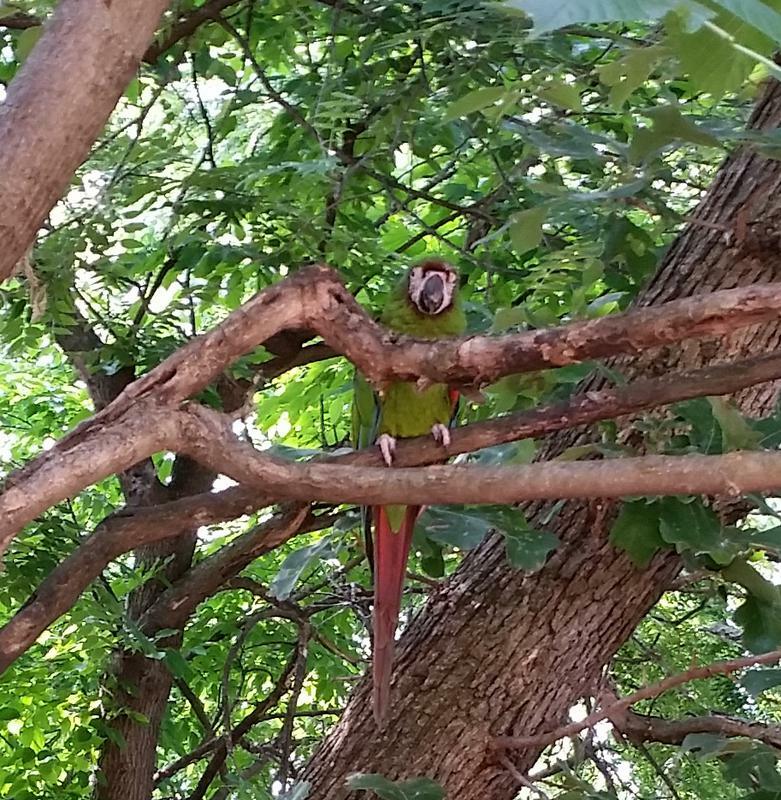 Severe Macaw in tree: A Raytown resident called us after they had been feeding a parrot in their back yard for several days. After luring him from his tree with a yummy looking peanut, Dr. Julie grabbed him by the leg and yanked him from his branch. She suffered a bloody bite wound, but saved him from certain death in the wild. Nobody ever claimed this guy, but then again he turned out to be a biter, so someone probably just got tired of him and set him free to suffer whatever fate befell him. Fortunately, an understanding and caring person has adopted him into their home. 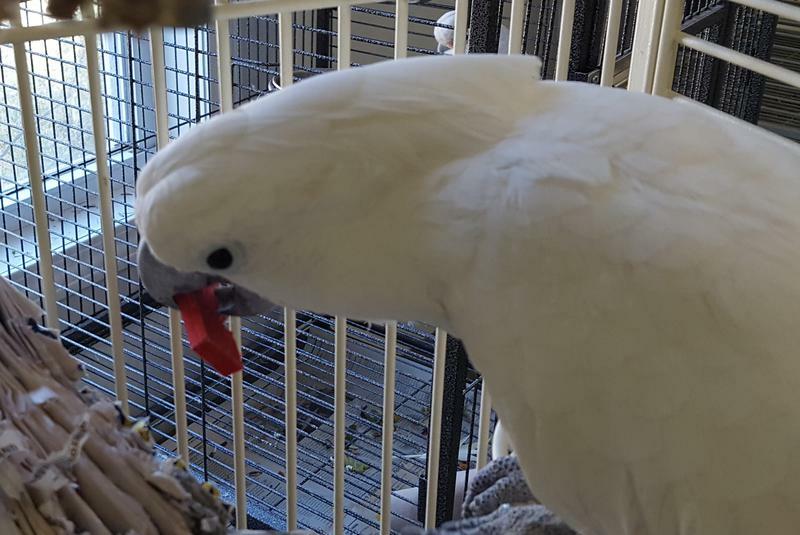 Foreclosed and abandoned: An Umbrella Cockatoo and a Goffin Cockatoo were going to be left in a foreclosed mobile home. The owner called us late in the afternoon and said if we didn't show up within a couple of hours, she couldn't guarantee we would be able to get into the trailer to rescue them. Once again, we had to cancel our plans of going home for the evening to deploy and save some feathered friends who might die without our help. They have both moved on to what we hope are loving, forever homes, where they won't have to live in fear of being left behind like garbage. So that makes 10 rescue stories, but we couldn't resist adding bonus story #11! We breed birds? : For the first time ever, we had a baby hatch in our rescue. A couple adopted two doves from us, but despite our instructions, they let the pair breed and hatch a baby. A couple of months later the pair was on eggs again, but the humans decided they didn't want any more birds. When they called and then brought the birds in they told us there were three of them, but they didn't mention the eggs that were due to hatch any minute. Only one of the eggs proved to be fertile, but despite it being cold, the baby survived and hatched that night. Grace is the only baby bird we ever had born in our rescue, and the sweet baby now has a loving new family. The photos show her on her hatch day, Day 7, and Day 21 with her mom in the background. Incredible how fast she grew, isn't it? TOP TEN RESCUE STORIES OF 2016, WITH BONUS STORY #11!